Today’s route map. An interactive version is available below. Words cannot describe the feelings I experienced today. I could say I was awe-inspired, and it would not be enough. I could say I was terrified, and it would not be enough. I could say I was exhilarated, and it would not be enough. So much happened today that it was difficult to keep track of every event, but I will try my best to recount today’s remarkable journey. Another weak surface low developed overnight in southwest Kansas in a similar setup to yesterday. 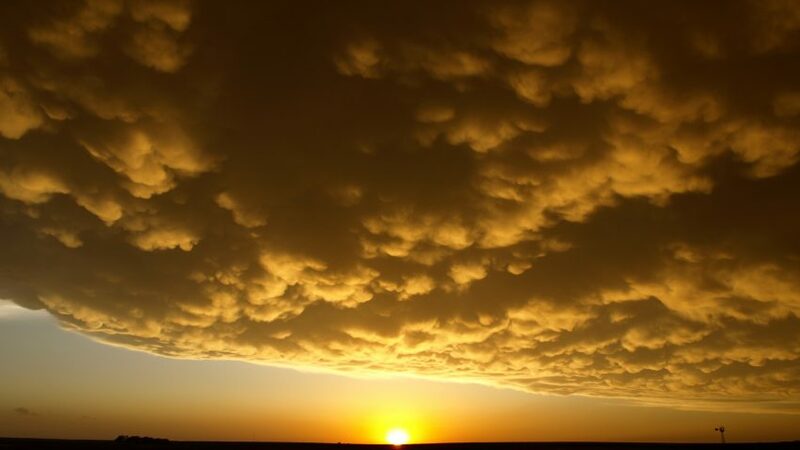 The upper-level trough was parked over the Mountain West, and continued providing almost daily ejections of vorticity and wind speed maxima into the central and southern Plains. This low again provided an anchor for the dryline that draped southward across west Texas, as well as some low-level convergence needed for lift. This low however lacked a clear warm front, which would have encouraged low-level shear by backing the winds near and along it. This problem was solved by yet another outflow boundary from an MCS in Kansas that stretched west-to-east across southern Kansas in the morning. We forecasted that this outflow boundary would be pushed north in the afternoon to align with the low pressure system and act as a warm front in this environment. Our target was where we thought this “triple point” of low pressure, dryline, and outflow boundary would align; southwest Kansas, specifically Greensburg for initiation. It should be noted that this environment is an extremely similar setup to yesterday, so we were initially wary of being overzealous. We had lunch in Greensburg and a 1 PM CST analysis of satellite imagery showed that the placement of the dryline and outflow boundary pushed our target to the south and west. 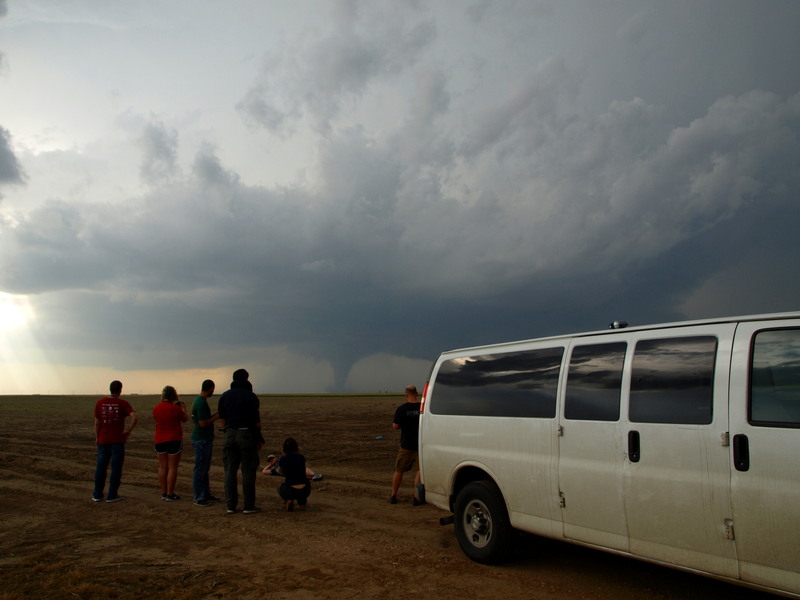 We decided to move to Meade, KS and wait for initiation. We tossed a Frisbee in Meade City Park until around 4:15 PM CST, when we believed that the only tornado of the day would be located in Scott City, KS. As we moved north, it was noted that directly overtop of Meade, a large convective updraft had fired and was growing quickly. 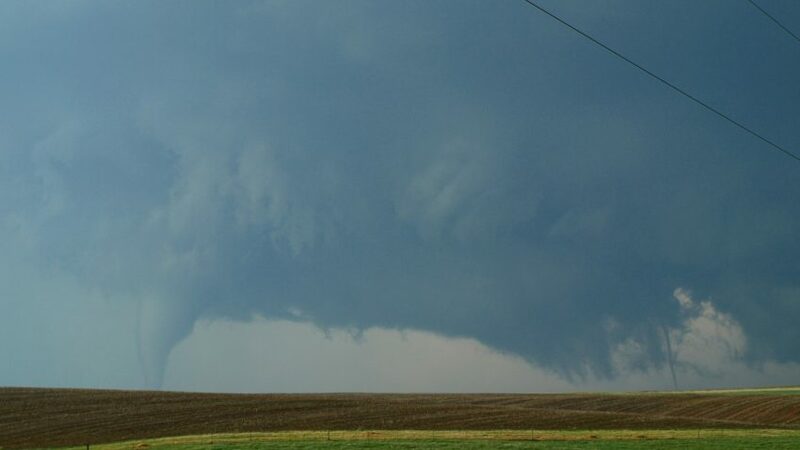 We turned around to intercept in Minneola, KS. This was a decision that shaped our entire day. Very quickly it became apparent that this cell was taking advantage of the abundant low-level shear, as the base quickly lowered and began rotating. 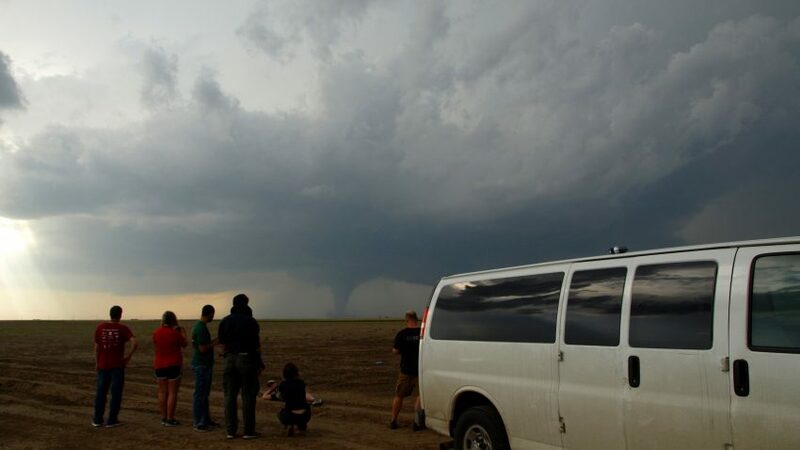 We were able to watch as the updraft lowered a funnel in front of our eyes (Figure 1). The sheer speed that the column was rotating was incredible to us, and we were able to watch clouds lift and form just feet from the ground. 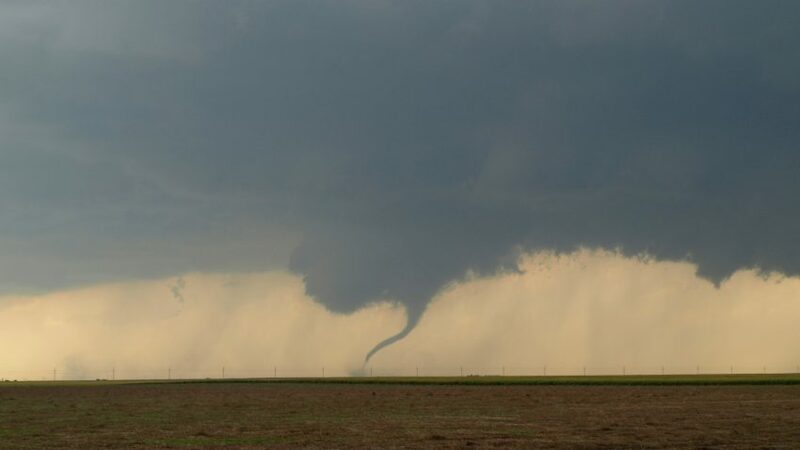 We rooted on our little funnel as it twisted over the empty fields of Kansas. The funnel touched down briefly at first, kicking up dust circulation near the ground. 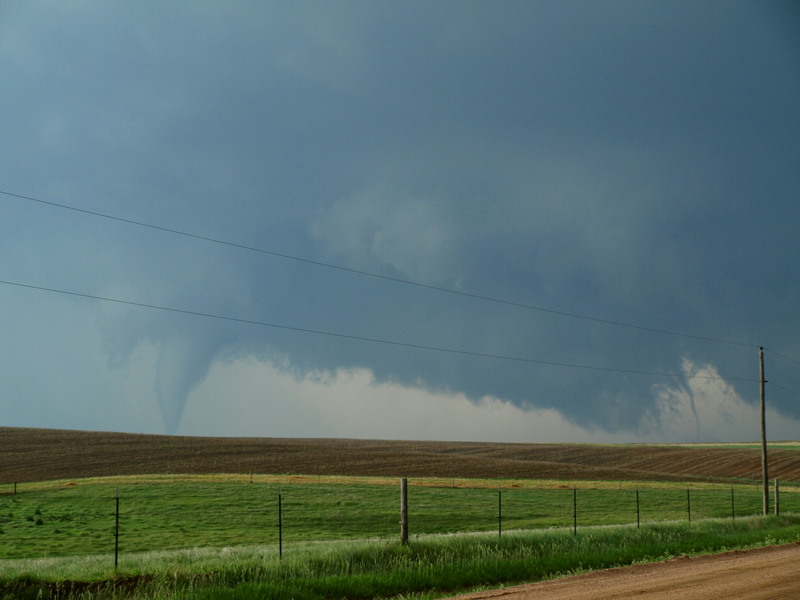 It then planted itself firmly and became a full fledged tornado, and grew in size from a small rope to a thick cord and larger (Figures 2 and 3). The giddiness of seeing this awesome structure became tainted with a small amount of fear. This destructive force was growing unchecked. What was a fun, cute rope tornado was now looking like an EF-1 and strengthening. 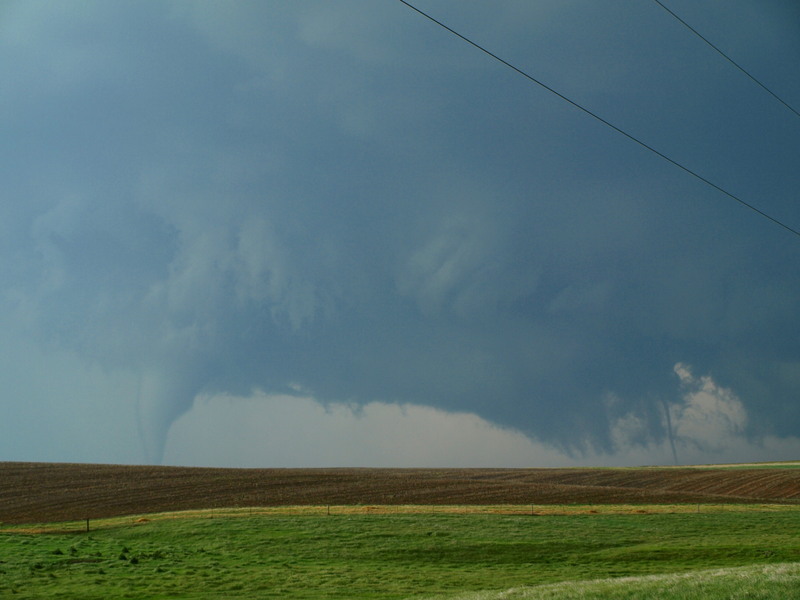 As we chased the storm north, the first funnel withdrew and roped away, but it was the first of many tornadoes that day. We watched the storm cycle through two to three more independent touchdowns as we chased, one occurring simultaneously. 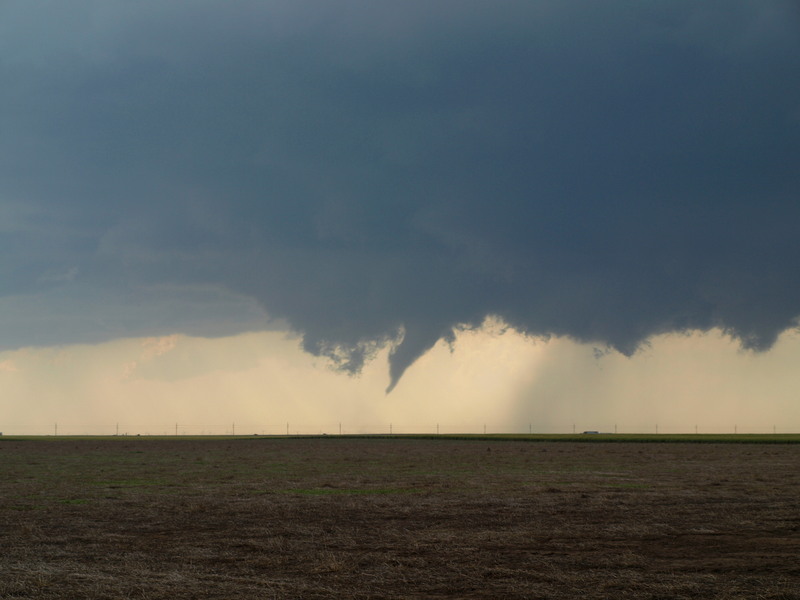 When we next stopped, a large funnel, the 4th of the storm by our count, had slid up the base and the storm was again going through vortex cycling (Figure 4). 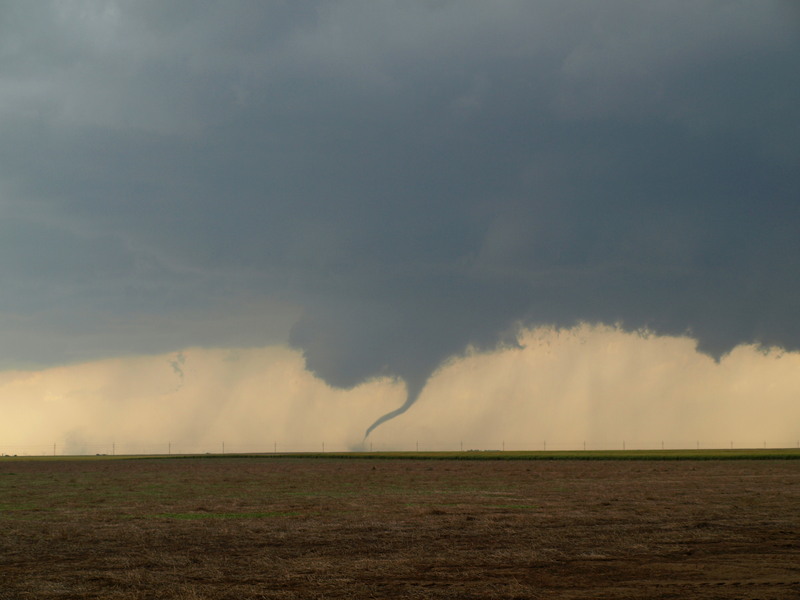 In seconds, the storm threw down two twin rope tornadoes, and the storm had three tornadoes on the ground at once (Figure 5). 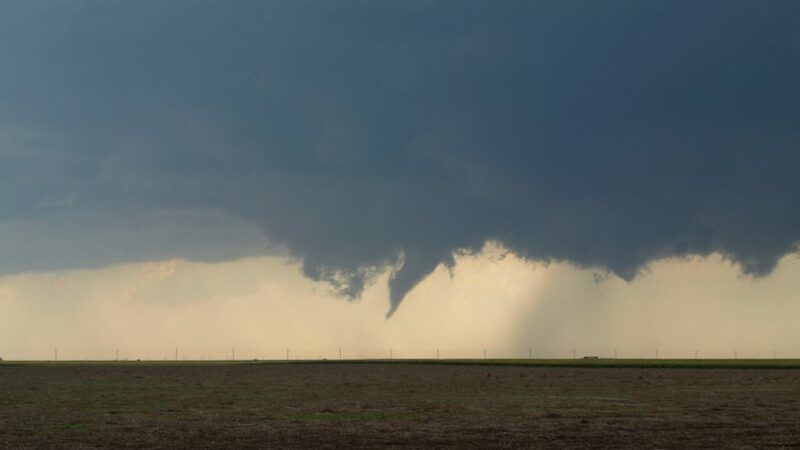 Never before had I experienced whatever emotion I felt in that moment This storm that contained three tornadoes was headed directly for Dodge City. My adrenaline was roaring, and recognition of this storm’s incredible power really resonated for the first time. This was obviously something incredibly special and incredibly dangerous. 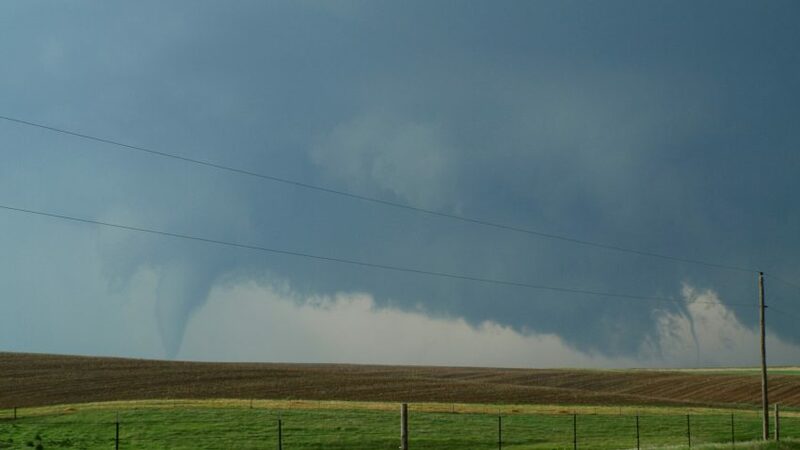 After 9 visible tornado touchdowns and quickly deteriorating road conditions became a problem (Kansas dirt turns to Kansas mud very quickly), we decided to escape the area, as storms to the south and west were quickly cutting off our escape route as the storm moved through west Dodge City. As we raced west on the south edge of the storm, we were able to view some damage in the storm’s path. Power lines had been completely ripped from their bases and were no longer at the side of the road, having been carried by the winds to the middle of some far-off field. Fences had been ripped from their posts. Heavy rain and hail from a ventilating storm to our south blocked our view of some power lines that were hanging mere feet from the road, almost until it was too late. A powerful downdraft pushed a semi-truck into the oncoming lane, and we had to swerve to narrowly avoid it. (A large thanks goes to Dr. Durkee for saving our lives). 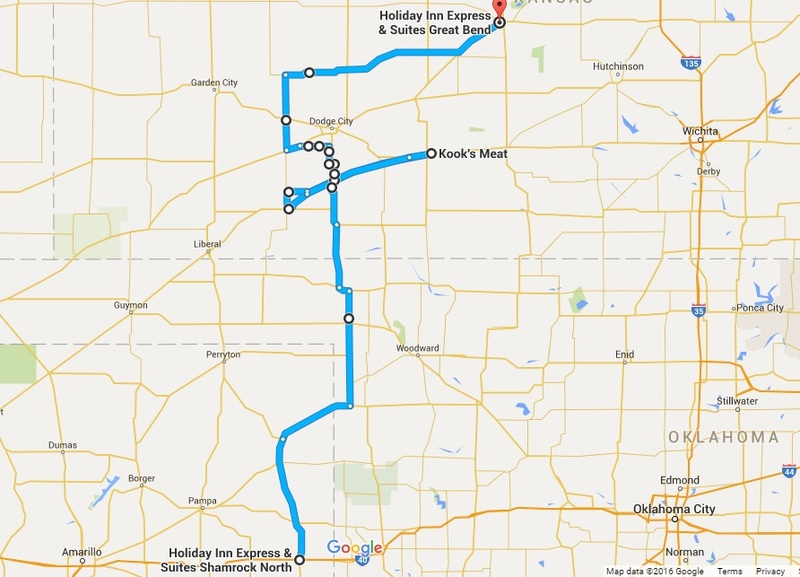 We passed through Cimarron, KS where we learned that both roads east into Dodge City had been closed, so we proceeded north and east to our hotel in Great Bend, KS. We stopped to show that beauty can be found even in the most violent of situations (Figure 6). Today proved to me just how important an understanding of meteorology is to our society, and how nature can be as beautiful as it is destructive. The feelings I felt today are feelings I believe I will never feel again. I trembled as we left that storm, and I still feel the power of it this evening. I know I speak for all of the students when I say that this is a day we will remember forever. Click this link for an interactive chase map! This entry was posted in U.S. 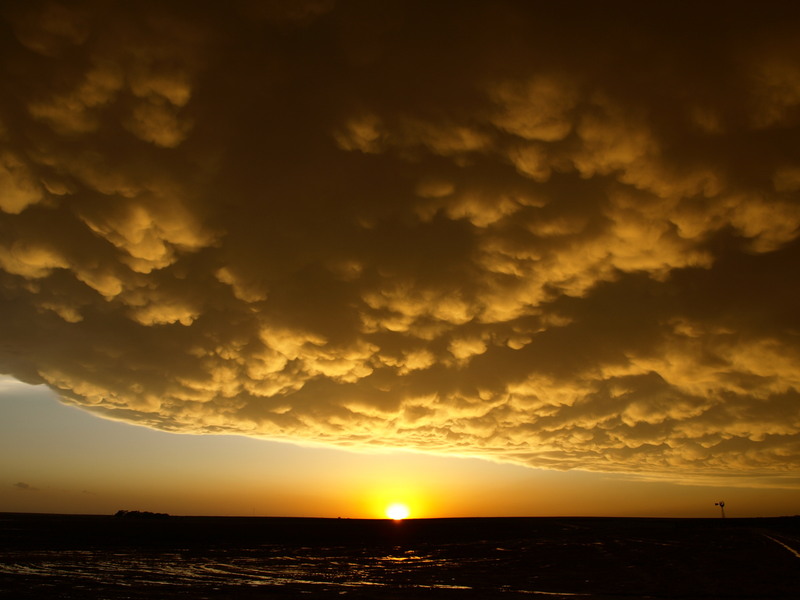 Weather and tagged dodge city, Kansas, severe weather, Storm Chase, tornado. Bookmark the permalink.